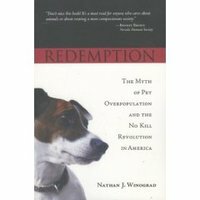 Last weekend I went to the presentation and book signing for Nathan Winograd that was sponsored by No More Homeless Pets. Winograd has taken an interesting approach to dog rescue. He found it disturbing that the leading cause of death of healthy dogs in the United States is by euthanasia. In other words, the very people who are supposed to be caring for, saving and rescuing these dogs are the ones that are responsible for killing most of them. In total, over 5 million healthy dogs and cats are killed in shelters annually. Most shelters, rescue groups and animal rights groups are quick to blame others for this problem. Irresponsible owners return dogs to the shelters. Breeders are causing terrible overpopulation problems. There aren't enough responsible owners out there for dogs. While many of these statements are true, Winograd thinks they are a cop-out for shelters. There are approximately 75 million dog that used as pets in the US. Based on the average lifespan of dogs, there are more people in the market every year for new dogs (replacement dogs for lack of a better term) than get eutanized in shelters every year. However, only about 15% of these people get their dogs from rescue. There are many reasons for this...but much of it comes down to the shelters not doing enough to gain a larger market share of the replacement dog business. Winograd stresses that shelters should be doing more to attract adoptors -- including doing off-site adoption events EVERY DAY, having later hours so people can visit animals after work, having friendly, responsive employees, and having clean, inviting kennels when the dogs are kept. He said that in many places these types of programs have led shelters to double their "market share" of replacement animals --- virtually eliminating the "overpopulation problem" in those communities. Ironically, less than a week after the Winograd presentation (I don't think anyone from the KCMO shelter attended the event), KCMO animal shelter announced that they were going to be open for more hours during the week. The shelter added hours to be open from noon-4 pm on MONDAYs?!?! The shelter hours are now: noon-4, Monday, Tuesday, Wednesday, Friday and Saturday, and noon-8 on Thursday. Can anyone honestly tell me of anyone they know that was just DYING to go to the shelter but couldn't fit it into their schedule, but whew, thanks to Monday noon-4 I can now make it? How about exteding the hours on Saturday? 10-6? Or being open on Sunday -- noon-4. Or having more evening hours -- staying open until 8 on Wednesdays too? Noon-4 on Monday's helps nobody. The KCMO shelter is not blessed with the most convenient location in the world for people to get to (for those who probably don't know, it's on Raytown Road just South of the Sports Complex)....so making it easier for people to have time to come by the shelter is imperative if they're going to improve their adoption rates (which would bring down their kill rates). It shouldn't be that hard. I'm going to also note here that adoption programs are not a complete solve. They shouldn't be seen as replacement for low cost spay/neuter programs or flexible legislation that doesn't punish rescue folks and responsible dog owners. They should be a complement to a well-rounded, dog-friendly community -- which many are trying to build here in spite of government intervention making it more difficult. For more about Nathan Winograd's philosophy, buy the book, read this story about it from the San Francisco Chronicle, or check out his website or his blog. I recently adopted a husky from the KCMO shelter and their restrictive hours is still one of my big complaints. The second one is the road construction on Raytown Road, that made for a confusing ride at best. But as a third suggestion, since the shelter is close to Arrowhead Stadium and Kauffman Stadium, how about opening prior to home games to attract some new forever homes. Personally I find it disturbing that so many animals are euthenized at this shelter, and yet no one is accepting responsibility. When are people going to realize that not everything is for the betterment of our canine friends, for it is they, not us who will make the ultimate sacrifice. If people would stop buying from the advertisers in the paper for one, and keep better care of the intact animals they do have Kansas City would be a better place. 1. You are a breeder and you know what genetic diseases to test for hips, eyes, etc. 2. Perform these genetic disease tests for your dogs, and should the results show that the dog is not sound in any way, have it spayed or neutered immediately. 3. You are a member of one of the AKC, UKC or other recognized clubs and attend meetings or help them out. Being member of a group will add somewhat to your credentials, but above all, act in an ethical manner. 4. You have consulted with other club members and have thoroughly studied the pedigrees of both Dam and Sire. 5. Have a plan for the future of the puppies. Should things not work out with the new owners, have in that contract the dog comes back to breeder, no matter what. I realize that there are areas too numerous to cover, but these are some of the things that I have dealt with over the years when it came to buying dogs. Thank you for the chance to express my views.